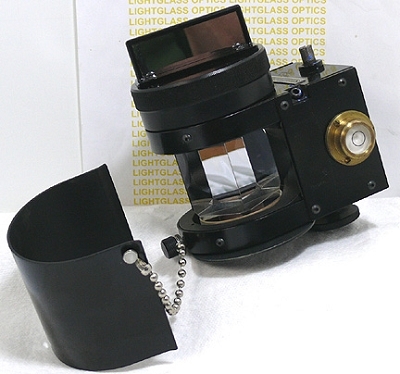 The 71-2430 Planing Prism is no longer made by any manufacturer, but offers unique ablilities. Mounted to the front of any Alignment Telescope, or Line Telescope with an A.I.A. Standard 2-1/4" diameter barrel, The line of sight can be "swept" across more than 180 degrees. This plane is accurate to 2 seconds of arc. Useful for establishing long horizontal or vertical lines without moving the telescope at all!. This does not mean you are limited to horizontal or vertical---you can sweep any angle and see if all components line up! There is a optically flat mirror mounted in the base that allows you to determine 90 degree angles, as well as a mirror on the top rotating knob to establish lines.